I get a lot of enquiries about rehab from owners and one of the essential precursors to a horse coming to Rockley is their vet's consent. The vast majority of vets are happy to refer horses here once they know a bit more about us but a lot have no real idea of what our rehab consists of, or how its different from simply taking the shoes off a horse. 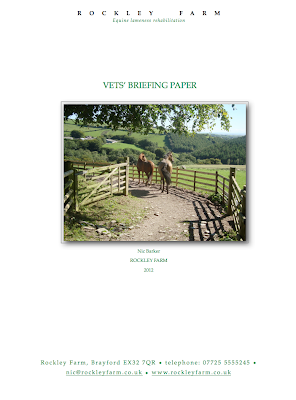 Others have had bad experiences of incompetent trimmers laming horses and are understandably wary or simply have questions about research, rehab or our results so far. So, as a way of providing some (I hope) useful information I've put together a short briefing paper for vets giving details of how our rehab works and how it differs from conventional treatments, information about research and our facilities.